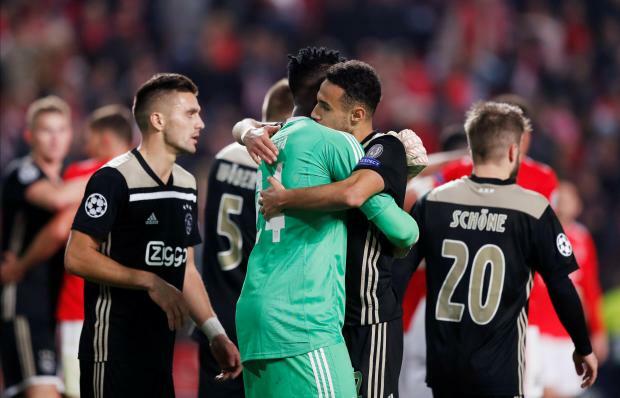 Ajax Amsterdam goalkeeper Andre Onana went from villain to hero as the Dutch side drew 1-1 at Benfica on Wednesday, gifting the hosts the lead before making a brilliant save with the last kick of the game to rescue a point. Jonas put Benfica ahead after a double mistake by the 22-year-old Cameroon keeper but Dusan Tadic levelled for the visitors in the second half of the Group E game. The draw left Ajax on the brink of reaching the round of 16 for the first time since the 2005/06 season. The Dutch side are second with eight points from four games, four ahead of third-placed Benfica, and also have the better head-to-head record. There was an early scare when Ajax defender Matthijs de Light clattered into Jonas and it appeared that the Benfica forward might have suffered a head injury, but he was allowed to continue playing. Under huge pressure after losing their last three games in all competitions, Benfica were gifted the lead in the 29th minute. Onana dallied as he controlled a pass back, nearly got caught as he tried to turn past an opponent on his goal line and was forced to toe-poke the ball into touch. From the resulting throw-in, Onana came out and completely missed the ball which fell to Jonas who chested it down and found a gap between two defenders on the goal line. After nearly equalising from a ferocious Lasse Schone free kick in first-half stoppage time, Ajax finally levelled in the 61st minute. Hakim Ziyech looped a tantalising ball over the Benfica defence and Tadic managed to squeeze between two defenders to get there first and poke the ball over the line. Onana came to the rescue in stoppage time, blocking a shot from Rafa Silva and then, from the corner, making a point-blank save with his leg from Gabriel when the midfielder seemed certain to score.